I'm coming to you from a classified location, somewhere under the frigid waters of the North Atlantic. The Cold War has gone hot, but there's nothing warm about this particular theater of operations. Cold Waters, the just released title from Killerfish Games, has you as the captain aboard one of several different submarines, lurking about looking for prey in a dynamic full scale war environment. I did not get a review copy until the day of the game release, and I have not had enough game time to reach a final verdict before setting off on a full-fledged family road trip tomorrow. So I thought I would at least give some first impressions on the game since I know a lot of people are interested in it. Such games as this are few and far between, but there is definitely an audience out there looking for their next chance to fire off a few torpedoes into unsuspecting vessels. So, is this a technical simulation requiring hours of study to even know what is going on (I'm looking at you Dangerous Waters) or is it an arcade style combat game focused on blowing stuff up? Cold Waters manages to tick all of the naval lingo boxes you could hope for, while being startlingly simple to jump right in to. This will probably make it ideal for most players looking for some Cold War naval action, while perhaps not meshing with a few gamers on the extremes of that spectrum. The sub battles can sometimes turn into real knife-fights. 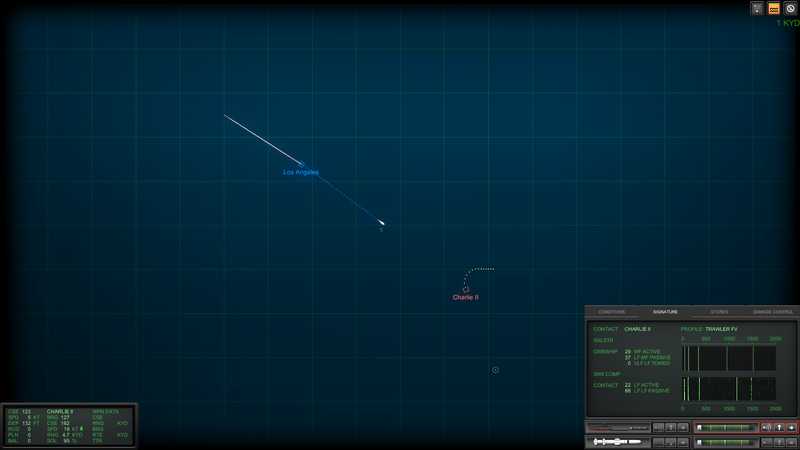 On the one hand, to play the game effectively you will need to understand and manage active/passive sonar, what cavitating is (and what depths/speeds it occurs at), steering your sub using speed/rudders/flaps/ballast at the same time, weapon loadout, planning your attack as well as your escape, dealing with upwards of a half-dozen or more torpedoes in the water simultaneously (yours and theirs), and how to use the thermal layer to your advantage. On the other hand, the game is played entirely with a third-person view of your sub. Looking about in the crystal clear waters, you will be able to watch enemy torpedoes coming in as you try to dodge them. 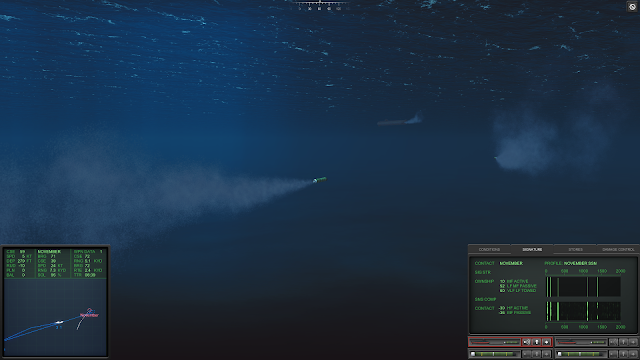 This can feel a bit like cheating at times, since you can even jump the camera to one of your wire-guided torpedoes and steer it into an enemy sub. That said, the situation often becomes complex enough that you need all the help you can get. Targeting and firing your torpedoes feels a bit too simple compared to the likes of Silent Hunter 3 and its kin, since you simply look at the map and click where you want the torpedo to go. However, you do still need to be pointing in the correct direction to fire off the shot. You can also jam your tubes if you try firing while maneuvering too sharply. 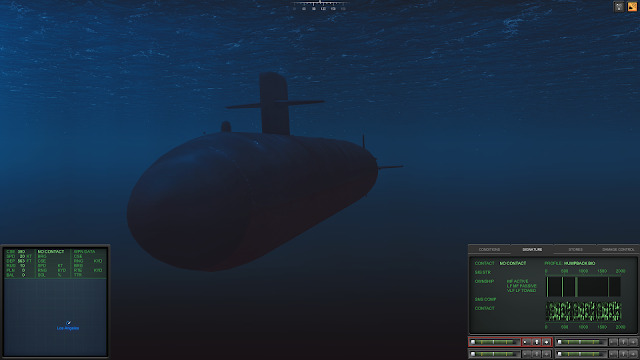 I'll save a more detailed discussion for my full review, but my current thinking is that if the above paragraphs didn't dissuade you, and you are looking for some sub simming action, then Cold Waters is definitely worth taking a close look at. The missions and campaigns quickly get you into the action, but then you will usually need some real strategy and planning to accomplish your goals and live to tell the tale. That escaping alive part is really the crux of the game. More than a few times I got my crew killed by firing off my weaponry, then lingering about since I had not thought that far ahead. 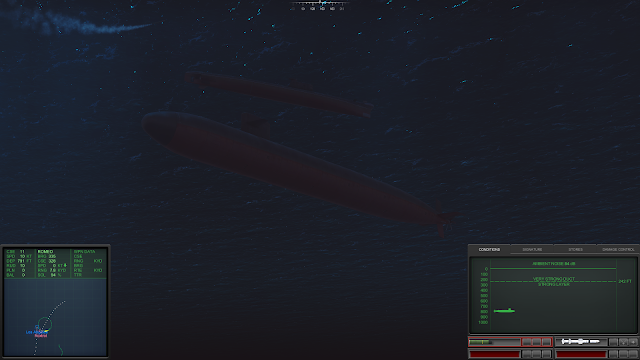 Anti-submarine aircraft are usually swarming above, just waiting for you to reveal yourself, and then the hunt is on. Run too hard and you may run smack-dab into an enemy sub that was patiently waiting for you in silence. Once the enemy torpedoes start closing in, the tension level ramps up to white-knuckle levels. Look for my full review and a gameplay video in about a week.